PR: Cinnamon Available on DVD Today! Cinnamon, a spoiled Maltese puppy, loves to have her mommy, Madeline, ALL to herself.� But there�s trouble when Madeline meets the man of her dreams, Kevin.� And now Cinnamon has to share her mommy with Kevin and his 13-year-old son, Jordan. They are all in for a dog-gone Hollywood adventure when the crafty little canine goes into overdrive to break this relationship up.� With the help of her doggy friends, Cinnamon knows that she will�get her way. SYNOPSIS: Cinnamon, a spoiled Maltese puppy, loves to have her mommy, Madeline, ALL to herself.� But there�s trouble when Madeline meets the man of her dreams, Kevin.� And now Cinnamon has to share her mommy with Kevin and his 13-year-old son, Jordan. 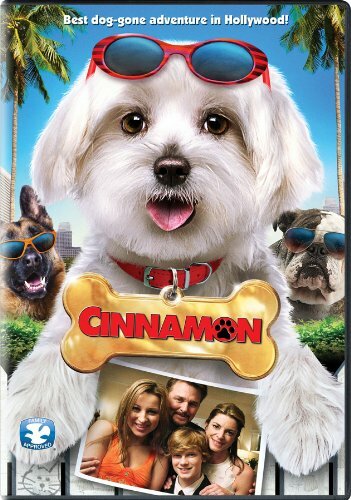 They are all in for a dog-gone Hollywood adventure when the crafty little canine goes into overdrive to break this relationship up.� With the help of her doggy friends, Cinnamon knows that she will�get her way.� What she doesn�t realize is that having a family might actually be what she is truly looking for!